All workplaces constructed before 1990 should be assessed for the presence of asbestos, with the findings recorded in an Asbestos Register. All workplaces constructed before 1990 should be assessed for the presence of asbestos, with the findings recorded in an Asbestos Register. Some jurisdictions require all workplaces constructed before the National Asbestos Ban in December 2003 to be assessed. For newer structures and equipment it may be possible to use original design and material specifications to determine whether asbestos containing materials (ACMs) are likely to be present. If specifications are not available, a Workplace Asbestos Audit should be undertaken, or suspect materials should either be sampled or presumed to be ACM. If asbestos materials are identified or presumed to be present, an Asbestos Management Plan (AMP) should also be prepared. BENSS' Asbestos Audit Reports also function as the Asbestos Register, including all the information required by State and Territory legislation. 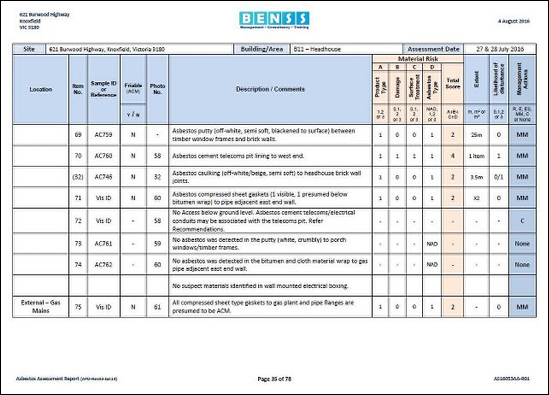 Our reports are designed to be clear and easy for use by all, not just industry professionals, and incorporate Risk Assessments, Photographs, and Marked Plans highlighting locations of materials. Non-asbestos materials present in an area are also reported during a typical audit, (negative reporting), which can save time and costs if potentially suspect materials cause concerns later. Negative reporting allows non-asbestos materials to be identified quickly, without needing additional samples at a later date. Recommendations for risk controls are presented in our Asbestos Registers and all Asbestos Audits and Risk Assessments are conducted by our Experienced & Licensed Asbestos Assessors. Many of our clients control large or multiple sites and assets. 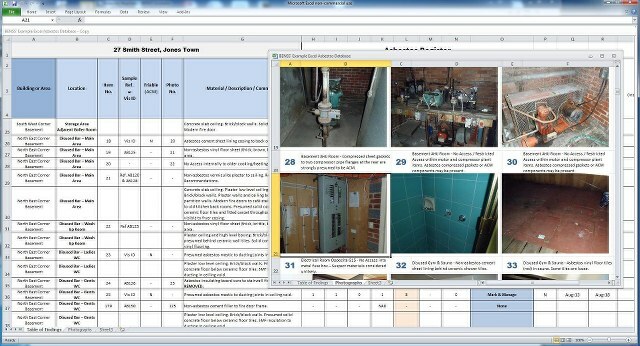 In these situations we can provide a tailored Excel database version of the Asbestos Register, including Photographs and Marked Plans. The Asbestos Register Database is well suited to centralised asbestos management for large or small organisations. Elements of the database format, such as colour coding and risk assessment scores or criteria, can be tailored to individual Client needs. Information can be efficiently reviewed, and management actions prioritised. As a live document, the Asbestos Register Database can be maintained up-to-date, providing an important record of historical asbestos works and control measures.